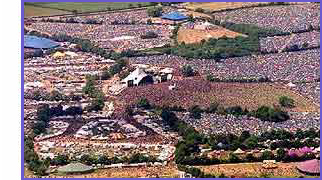 Glastonbury Forum: LIFE Festival - 15th-17th June - IRELAND! Topic: LIFE Festival - 15th-17th June - IRELAND! LIFE Festival - 15th-17th June - IRELAND! The time for everyone to begin their plans for life has arrived ... aspirations... dreams...a journey of discovery...a project of Love and illusion, faith and hard work believing in something special with a vision that all that we have ever dreamed about can be possible in Life. Workshops, Performers, astonishing visuals and decoration. Cinema, Stalls, Healing area and Camping facilities. Believing in Life? If so, this is for you!
" Offer valid till we reveal the stages and lineup within the next days, so get it now while still available." Limited tickets at the special reserved price of €59 or £39 !!! Life Festival 2007 is a special event which presents a vibrant range of cutting-edge music, visual and traditional arts, workshops and performances through a camping based three day weekend of celebration, partying and respect for the environment and each other. Life Festival aims to be a unique experience in the perfect scenery. It is inspired by other international music and arts gatherings across the planet earth. Those events are encouraged by a global community that travel the world seeking for new magic places and experiences. If you have a deep desire for refreshing experiences then Life Festival is your ideal party destination. Life Festival will offer a mixture of well known artists as well as an innovative injection of global underground talent spanning a wealth of different musical genres. Both the old and the newest, the live bands and the electronic acts are to be enhanced by mind blowing decorations and visuals. This Festival is an open appeal to all those with a passion for creativity and art. Life Festival ultimate goal is to celebrate LIFE with strong respect for the environment and mankind. More @ door, if available!!! !